More than a century after it was first commissioned, Barcelona's most iconic landmark remains unfinished. The Sagrada Familia church is Catalan architect Antoni Gaudí's greatest masterpiece, but he never lived to see his most legendary creation come fully to life. In fact, none of us have (yet). The church is still under construction, with completion scheduled for 2026—a century after Gaudí's death. Despite technically still being a construction site, the Sagrada Familia remains Barcelona's most popular tourist attraction, drawing more than 3 million visitors each year. And while the jaw-dropping interior of the church certainly speaks for itself in many ways, knowing a little bit of background information about the site can help take your visit from good to great. 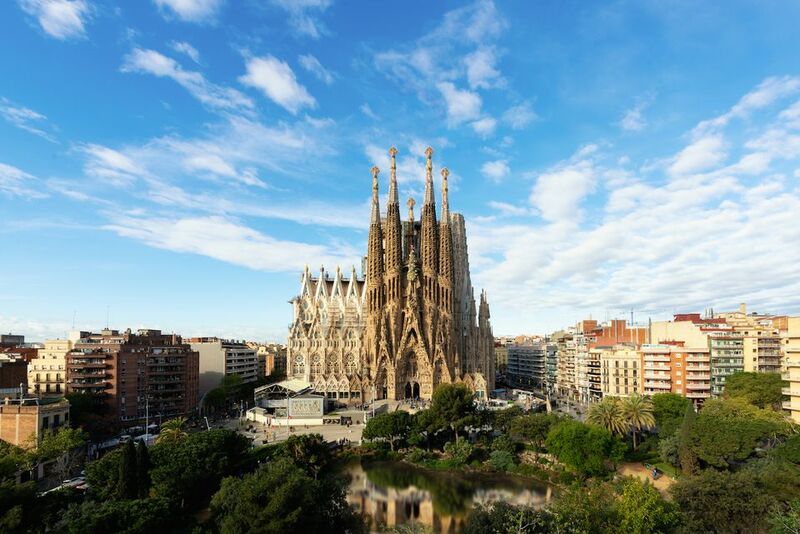 The story of the Sagrada Familia begins in 1874, when a local religious organization began campaigning in favor of the construction of a church honoring the Holy Family. Plans were drawn up, and the cornerstone of the church was laid on March 19, 1882, under the supervision of the project's original architect, Francisco de Paula del Villar y Lozano. That's right—Gaudí had no involvement at all in the earliest stages of the Sagrada Familia. After Lozano left the project due to creative differences with developers, Gaudí was brought on to replace him. He discarded Lozano's original plans for a neo-Gothic design, instead focusing on a modernist creation that would change the skyline of Barcelona forever. Starting in 1914, Gaudí stopped developing new projects and dedicated himself entirely to the Sagrada Familia, becoming so involved with the project that he practically lived in his workshop during his final months. By 1923, he had finalized his sketches. The church's first tower, on the Nativity façade, was completed in 1925. Sadly, it was the only tower that Gaudí would live to see rise. He died on June 10, 1926 after a freak accident involving a tram, and his remains are interred in the Sagrada Familia's crypt. In the near century since Gaudí's death, five generations of architects and builders have taken over construction of his creation, tirelessly working to remain as true to the original designs as possible. Unfortunately, it's hard to know exactly what his vision was in certain places. In July 1936, anarchists set a devastating fire that destroyed his workshop—and with it, the majority of his original ideas. Subsequent architects worked to painstakingly piece together the surviving remnants, combining them with their own ideas in order to create a building that would make Gaudí proud. In 2010, the church was officially consecrated by Pope Benedict XVI, marking a significant turning point in its story. Gaudí knew that the Sagrada Familia would take decades to build, and that he would not live to see its completion. He'd already kept in mind that the finished product would not be entirely his, but rather a collaborative effort developed throughout generations. The exterior façades draw inspiration from the Gothic styles of the Middle Ages, but with Gaudí's signature art nouveau touch. Step inside and you'll feel as if you've been transported into a mythical fairytale forest, with high, vaulting columns framing colorful stained glass windows and rising up to support an intricately carved ceiling. The Sagrada Familia enjoys a splendid location just a few blocks north of Barcelona's buzzing Avinguda Diagonal. It's easy to get to on foot, but if you prefer to take public transport, hop on metro line 2 or 5 and get off at the Sagrada Familia stop. A number of local buses also stop nearby. In order to save time and avoid long lines, it is highly recommended to purchase your tickets online in advance via their official website. There are a number of different ticket options available, with the most comprehensive option offering an audio guide and a trip up the tower. Consider your budget and what you'd like to get out of your visit and choose your ticket accordingly. If your plans are flexible and you don't mind waiting, you can also get tickets the day of. The ticket office is located on Carrer de Sardenya. Keep in mind that to access the church, you'll have to go around the building to the main entrance on Carrer de la Marina. Arguably the most iconic image of the Sagrada Familia is the Nativity façade, which was completed under the supervision of Gaudí himself. Also of note is the Passion façade, depicting Christ's final days, created mainly by sculptor Josep Subirachs from 1986–2006. In focusing on sharp, angular images, his designs deviate from Gaudí's vision, helping contribute to the church's status as a collaborative effort. Don't miss the Escoles de Gaudí in front of the Passion façade, either. A simple yet impressive architectural gem, Gaudí originally constructed this part of the building as a children's school. Today, it houses a reconstructed representation of his office at the time of his death, offering a fascinating peek into the life of the man behind the iconic building. For more of a Gaudí fix, head down to the museum honoring him located in the basement of the church. A corridor leads from the museum to a viewing point above his tomb, where visitors can pay respects to the man himself. If you're not afraid of heights, be sure to choose a ticket option that will take you up to the tops of the basilica's tower. The bird's-eye view of Barcelona will take your breath away. The Sagrada Familia might not be located in the happening heart of Barcelona's city center, but there are still plenty of great ways to experience this lovely little corner of town. After your visit, take a relaxing stroll down Avinguda de Gaudí, a picturesque, tree-lined avenue extending north behind the church. Stop for a coffee and continue until you reach the Hospital de Sant Pau. This onetime medical facility is now a stunning art nouveau complex that serves as a perfect complement to the Sagrada Familia. Craving more Gaudí works? With whimsical buildings that look like gingerbread houses come to life, his Park Guell is another Barcelona must. Walking there from the Sagrada Familia will take about half an hour (public transportation is also available), but it's quite a pleasant stroll through the charming Gracia neighborhood.